Are you game to give your opinion? Every Monday I plan to blog about a polarising topic which affects us all no matter where we live in the World. And I would love to know your thoughts. I was inspired to choose my first, rather heavyweight topic, after reading Kay’s latest blog post about what Japan, the slimmest industrialised nation in the world, is doing to manage its rising obesity levels. As Kay says, it is a sensitive issue for a lot of us so we need to tread carefully. In the interest of full disclosure, I am one of those people who has always struggled with my weight. Sometimes I feel like I am in some kind of Pudgy Purgatory, never destined to make it to the highly desired, yet unattainable utopia of Skinnydom. It takes discipline, will power and knowledge to manage what goes in my mouth. It is a choice for most of us but not always an easy one for a hundred and one reasons. However, the fact is, the World's population is getting fatter and fatter and you don't have to look far to see the evidence. It is everywhere. Strangely, after reading Kay's post, I opened this morning's newspaper to see this headline on the front page. Since the 1980s, obesity levels of adults and children have grown at an alarming rate across the world. In fact they have DOUBLED in what is a relatively short time. 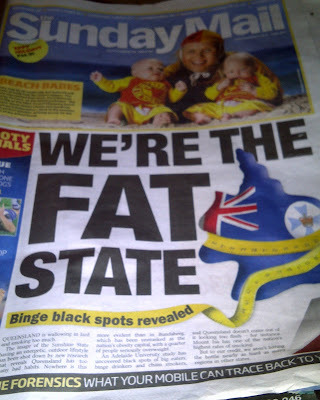 Australia, according to this newspaper report, is wallowing in lard and we are smoking and drinking to extremes. Gluttony it seems, has become the new sin of choice. And yet, oddly while all this eating is going on, we are also spending increasing billions on gym memberships, diet foods and weight loss clinics. Somewhere or other it has all gone pear shaped. We already know that obesity causes a huge host of health problems which inevitably will result in shorter lives, an increased burden on families, strain on the already overloaded heath care system and a drain on society in general. Who is going to pay for the poor food choices being made and consumed? Because it will not be just the people consuming the empty calories. 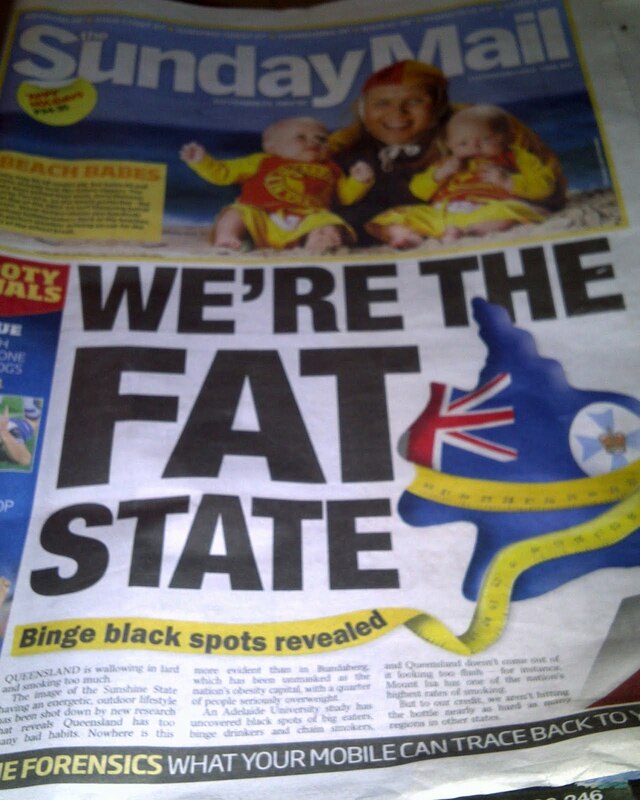 Australia comes 6th on the World Health Organisation’s Obesity World rankings. The USA is sitting in number 1 position followed by Mexico, United Kingdom, Slovakia, and Greece. Canada ranks at 11 and surprisingly, countries such as India are also quickly climbing the rankings. Japan on the other hand, rates at 28 with only 3% of its population considered to be obese (compared to Australia’s 27%). This bulging epidemic is forcing governments to take action. Some European countries, like Denmark have introduced a 'Fat Tax' on products with high levels of saturated fat, in the same way many have done with alcohol and cigarettes. Japan, on the other hand, has taken rather a more contentious approach to how it manages the problem. Being thin isn’t just the price you pay for fashion or social acceptance in Japan; it’s also now the law there. So what do we do before the world literally explodes? What strategies may work? Hmmmm, I wonder what would be effective with regard to this? I'm still 40 pounds overweight, and what would truly keep my hand from raising food to my mouth in too large portions/too often? It's an interesting debate, that's for sure! Honestly, as bad as the Japanese idea sounds in terms of Big Brother etc, it is sure getting people into shape pretty quick. Highly contentious though and would never work in our countries. Although while I say that when my daughter was at school they used to weigh and measure them and also test their physical fitness. So maybe fear is an option lol. It is hard but we know what we have to do and what works. It is just they have made the high sugar, high carb food just the thing when we get down or stressed. Its the companies to a large extent that need to be better governed. Its hard to eat clean because we have so much choice now. Sad though when parts of the world are starving. When you find the answer, you can bottle it and make trillions. Just recently there was a big hoopla over NYC's mayor stating that fast food places could not sell those extra large drinks. People were furious that anyone would try to govern the options. I thought, "All this will mean is that those same people who ordered the extra large drink will now get two large drinks. How did that help anything?" I don't know if I'm for the government getting involved, because half the time the health industry tells you one day that something is bad for you and the next day it's OK. It has to be a frame of mind. I read that Aleta. That is true, and doesnt stores in the US literally give away soda for next to nothing anyway? And I agree that we do get told conflicting things everyday about what to eat, what not to eat. Its a bit of a roll of the dice at times. Schools are the same here. They have done a lot of work to remove unhealthy options now but kids still bring them from home. Teachers can only do so much as the real learning on this issue starts at home. All we can is our best I guess. well, education in the schools might be a good start, I think they are trying...good topic Lilly. Interesting about Denmark's fat tax. Yes Christine, some European companies are hitting companies and therefore buyers in the hip pocket for buying goods with loads of saturated fats. I relly like that idea. And schools are doing a lot more that is true and many of them have gardens to teach kids about where food comes from. You did a MUCH better job with your post, Lilly. I didn't expect quite as much of the reaction I got as I did. Phew! The problem is, we do have to address this topic anyway. It's a real problem here in the U.S. Even in Hawaii (where we're happily 2nd from the bottom in obesity this year)we expect to be at 50%+ by 2030. Sadly, I think the answer to the problem is too difficult. There are too many corporations selling too many fatty foods. The mindset of people has come to expect a certain kind of food and exercise is more difficult to accomplish. I see what my granddaughter is eating and I'm worried about her. My daughter tries her best, but it's what KC is willing to eat. Yes, it was an interesting set of comments Kay and I don't understand why people have to get too defenisive as this is not about individuals but about a broader issue in society. People eat what the supermarket sells. Unfortunately a lot of it is crap food that is loaded with salt, sugar and saturated fats. It gets back to what happens in the family. People can only do better if they know better. I recall when my daughter was a small child I was very strict. Yogurt was the biggest treat she had and she used to run around eating broccoli stalks like they were icecream. It was much harder to control when she went to school though and was exposed to all the other sugary delights kids would bring. Plus supermarkets target so many things to kids. Its a nightmare. ANYWAY, great post and thanks always for some great inspiration. It is a subject we need to keep talking about as we mothers and grandmothers have a power of influence. hey Lilly! you know what ! a country like India where middle class is growing rapidly , life styles are turning sedentary and purchase power increasing and disposable money becoming available to the large number of middle class in addition to the poor eating habits we will soon surpass many close contestants because we Indians have got a sparing gene (research establishes the fact) which makes our body store some fat from what , however little, we eat . we developed this gene over a period of centuries when we used to regularly face drought and famine and this sparing gene was very much essential for our survival for a tough period. That is really fascinating Kirti. I am sure I have that sparing gene and have read about it. I wonder who I was in a past life....it truly is fascinating and am going to google some more. Thanks for the comment. I think a home cooked meal, fresh fruit and vegetables tastes better but it can be expensive to buy those items compared to the cheaper pre-packaged stuff. And these days, it is not only the budget but what is quick -to which the pre-packaged stuff wins hands down. I don't do any pre-packaged or boxed meals but I don't work outside the home and I have the money to buy healthy foods, so I feel badly it is not something everyone can do. I do think parents have a responsibility to teach their children healthy choices and limit sugar and soda, and provide the best food they can afford to give them an example to follow. Also limit the video games and get kids out playing again (I think children are really sedentary compared to how we grow up) or go on family walks. The fact that the govt. has to mandate healthy living is so sad to me, we should want that for ourselves and our children and the time and effort that goes in to that is not something we should sacrifice. I have a friend who offers her kids a bananna or apple as a snack when they say they are hungry in between meals and if they say no, then she says they are not really hungry. Thanks for visiting Krystal lynn. Yes that is an issue too that fresh products are getting so expensive that economically disadvantaged people are having to take the cheaper prepackaged stuff. I think your ideas are spot on and a lot of the responsiblity for that comes back to Mothers hey? I also take your point that we need to be moving more and all of us outdoors not just the kids. Great, great comments and thanks for joining in. It's a big issue for sure. My opinion is that we should control the food industry moreso. Their products are killing people. And if it comes down to it I really think Governments have to step in. Otherwise where does it all end? The issues are complex yet simple really. We are all different as well. I got allergy tests and realised some foods were particularly bad for me such as wheat. Sometimes we dont know this as there are no obvious signs. I now tend to avoid all packaged foods and try and eat as organically as I can. I drink green vegetable drinks that I juice most days because while I like a lot of salads I rarely cook veges. It is hard because rubbish food is so quick and tempting. And if I get upset or anxious I reach for all the wrong things. That is because sugar is addictive for a start. I just cannot have sugar laden treats in the house. I am also trying to live by the mantra that treats are only for special days like birthdays, Christmases etc. not every day. I believe in vegetable gardens and buying direct from farmers markets if not the farmer themselves (hard to do in urban areas). However there are a lot of food co-ops set up all over the world in the most amazing places that are so beneficial for families. For Aussie readers I have just joined Farmers Diret website online and I get products delivered to me for free. We are bombarded with advertising in all its forms about the latest food innovation so it is hard not to cave in. All we can do is the best we can and try and encourage those around us to do the best they can. We have so many choices we are drowning in them. Sometimes I think it would have been far easier to live 50 years ago when there was less choice. There will always be people thinner or fatter than others but now there are so many clinically obese residents in the world that something has to be done. The Japanes action is rather drastic but maybe drastic measures are what is needed. I do not think anyone wants to be obese. There are just a myriad of reasons why this happens but we need to do something. We cannot just keep saying it is no-ones business what people put into their mouths but them. It is our choice as adults to a large extent (provided we have the education to know where food comes from) but not for our poor children who are guided by their parents, teachers and friends. Our kids should be given the best possible start in life that we can give them. It certainly is one of the big problems of our era, Lilly. Strangely I remember that my parents, both born in the early twentieth century, lived to ripe old age and never seemed to gain any significant amounts of weight. They ate meat every day, regularly had sweets (puddings) with their dinner and partook of both morning and afternoon teas. They had lots of salt and butter and took sugar in their tea. Their lives were full of stress such as a serious economic depression, two world wars and the usual struggles of families with several children, yet they retained their slim builds. How do we explain the difference for more recent generations? I do know that my parents lived in the country where they grew their own food, they very rarely ate takeaway treats and, while their meals were healthy, their portions were small but quite adequate. Perhaps there is a lesson here for all of us. You raise some really good point Magee. I think if we ate like your grandparents then we would have less of a problem. You also raise an interesting issue that they were not wealthy either yet ate well. Obesity was not an issue in those days. Sodas, fast food joints, corn in every conceivable product, less physical exercise, pesticides, plastic food, I could go on. The reality is they knew where their food was coming from and we no longer do. Kind of sad. Good for you to post a controversial topic. Oh I don't care for Japan's idea. If I understood the clip, they force companies to measure everyone and then fine the company for overweight employees. I don't understand why a company would be involved. Many companies here have had "wellness" programs with incentives for the employees. But this approach does address the small companies or people who are not working. Controlling marketing of garbage food makes sense. People really need to change their attitude. I believe many people thought a new diet drug would be the silver bullet. You the saying about a carrot and a stick. I think the carrot (incentive) is the right way to do it. Have a national program that offers tax breaks for people joining a weight control program.
" But this approach does NOT address the small..." This comment system doesn't have an edit function - arrgh. Yes it is annoying but the other one I didn't like either. Maybe a new solution? Seriously, I blame the parents and society. It's not easy for parents to juggle 2 jobs, fast food becomes a necessity. Being teased fatty is frowned upon in school but peer pressure is one way to stop kids overeating IMHO. I think if we really lived to eat we would be choosing something better than a McDonalds burger surely. Living to eat? You dont even come from Melbourne so guess you cant really do that, lol. I think you can eat well but still indulge and that includes chocolate. I prefer not to keep too much of it around though as I will eat the lot not just one small piece. It is all the empty calories in sodas and packaged foods that has to be doing something. I don't have the answers at all. Kids in the shcool yard cannot say things like that now as bullying is not tolerated. I think people close to us just need to tell us when we are as fat as a house perhaps and urge us to take better care of ourselves if we want to stay alive. It has to be said. Of course, it is always a choice everyone has except for kids perhaps. Yes I know, more than half of us with nothing to eat and the other with too much. If governments have to pay for people's healthcare then they should be able to control lifestyle. I reckon they should be doing the same as the Japanese. Our taxes are going to healthcare programs to look after people who could not give a rats so we all should be concerned. The issue is that the highest obesity levels are coming from the most economically disadvantaged communities across the world. Plastic food is cheaper than real food and therin lies the problem. Honestly, the one thing that might make a difference is to make healthier food cheaper and the crap stuff more expensive. When I go shopping, I find that Tim tams are cheaper than a kilo of tomatoes at the moment. What's a family that's struggling with finances going to purchase? Same with eating out. You've got the likes of Maccas and Hungry Jacks being cheaper than joints that sell healthy food. And once you've tasted the junk food, there's no going back for some people. Now that I'm doing this 12WBT program I'm spending a lot more money on food shopping. Not that I ate too much junk before but I did take the easy way out by not buying the very expensive veggies. I hear you. Good luck with the 12WBT - my daughter loves Mich as well and has her books. She is influencing a lot of people and I love her recipes - they are quick and easy and healthy. You are right though, I use a lot of veges for juicing and it is expensive but worth it, hopefully. I think we have to continually examine the content of what we put in our mouths. So many foods that are aimed at helping us eat lighter and take the fat out- literally are heaping in non-nutritive substances that serve to do the opposite. "Enriched" wheat for example makes you think it has something added to it that is healthy- well it does have additives- because they had to take out the healthy part that would spoil in the bread... then they put the preservatives back in so it'll last forever... yet its true what other commenters have said- to eat more nutritiously is to spend double to triple the amount on food. Yes, Vicky I think that may be the cause perhaps of the rise in obesity levels. It was probably around the 80s everything became low fat etc. However, what they put in the food may very well be something that is causing issues now. Who knows. I think we just have to do the best we can to find real food and buy it as close to the source of where it is grown as much as we can. Or learn to grow food ourselves perhaps. I am fat cos I like food and am an emotional eater. People have a lot more stress in their lives and we are lazy. Its too easy to buy take out then spend some time cooking from fresh. There is now way what is happening would be allowed to happen in Australia. One word for you. Unions. People have a choice and unless their weight is affecting their job then the employer is responsible for zilch.